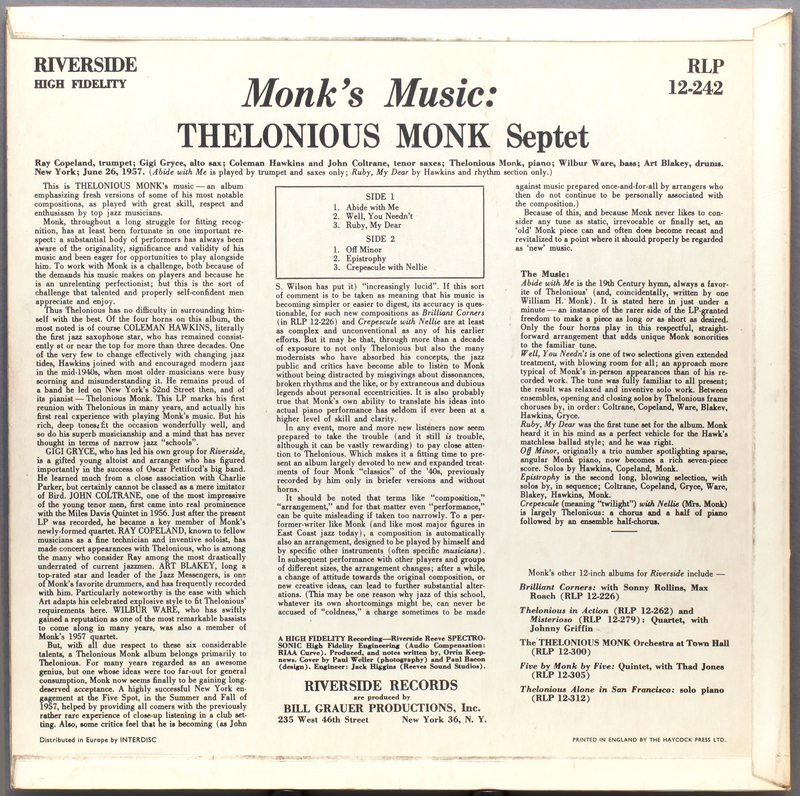 An album by Thelonious Monk Septet from 1957 that had been missing from my collection for a long time. Coltrane joined Monk after a spell with the Miles Davis Quintet, and this is Coltrane’s only studio recording with Monk, who can be heard enthusiastically calling on him to take the first solo on the selection “Well, You Needn’t” (selection) however Coltrane’s name does not make it to the front cover with Hawkins and Gryce. For connoisseurs of such things (Tony!) apparently the two mixes of this album (stereo and mono) are notable in that they used entirely different setups of microphones, recording the same performances. The stereo mix was recorded using mics at a greater distance from the band, and therefore has a distinctly different sound from the mono mix. 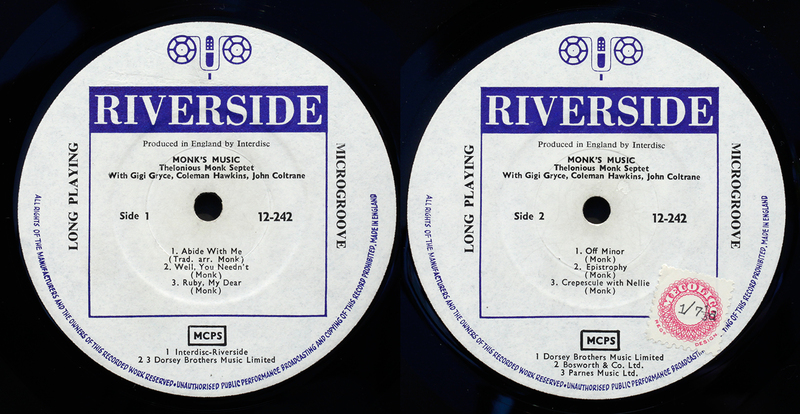 Very early white label with sunken central area – . Mecolico import stamp, however the record is “Produced in England”, so why the imported stamp I don’t know. Perhaps someone does. 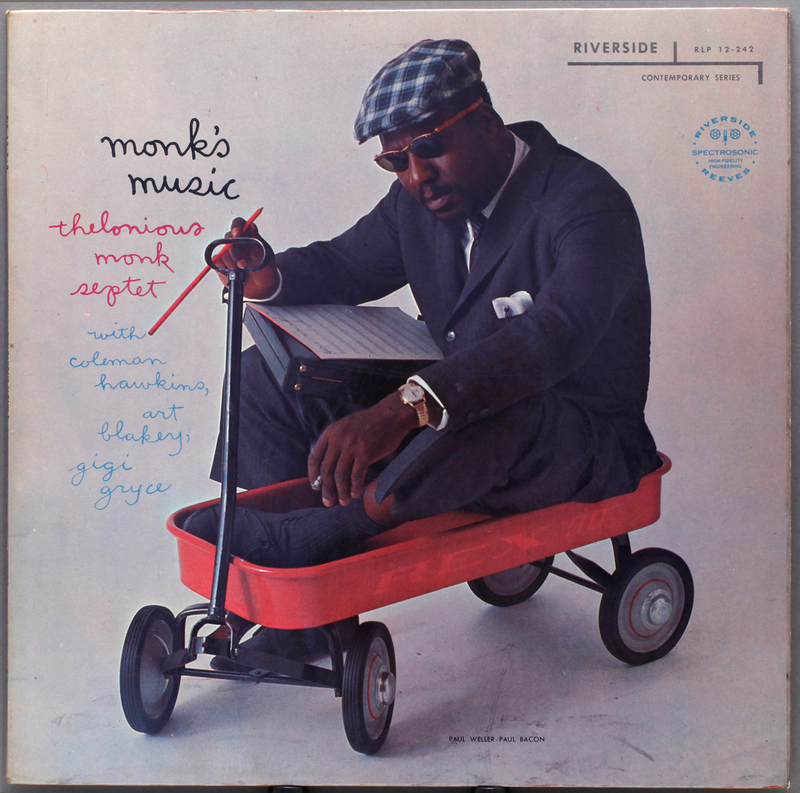 I am not sure Monk looks entirely comfortable posed sitting in a trolley without any obvious purpose, but the photographer and stylist get their credits on the cover, even if Coltrane didn’t. The Matrix: Hand inscribed matrix number common to a number of UK Riverside, not obviously the work of either Philips or Decca, both of whom pressed Riversides for a time. Source: London record store, part of a recently purchased collection that didn’t even make it to the new arrivals shelf. LJC was there first. This collecting business is sometimes way too spooky. By a strange coincidence I had chased and lost lesser copies this record twice on eBay in the preceding weeks. A copy of the US original currently on ebay is asking an astonishing $199 opening bid in VG MINUS condition.I will leave you to decide if it is worth it. 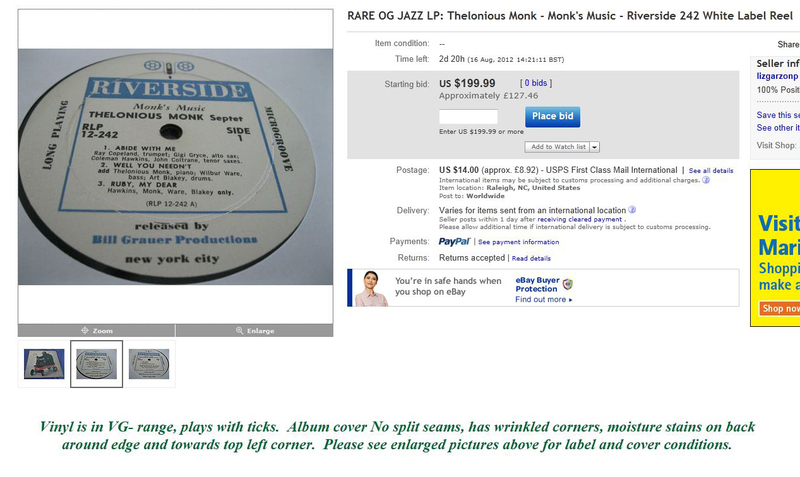 This entry was posted in Riverside, Thelonius Monk and tagged Art Blakey, Coleman Hawkins, gigi gryce, John Coltrane, Ray Copeland, Riverside, Thelonious Monk, Wilbur Ware by LondonJazzCollector. Bookmark the permalink. I really like this one – at times, ragged and loose, but a great lineup and good stereo sound. It sounds excellent over loudspeakers. Horns playing the opening hymn is pretty special. A friend told me Coltrane fell asleep during “Well You Needn’t” and almost missed his break, hence the shouting from Monk. I haven’t verified that but it adds to the mystique. ‘Monk’s Music’ has got to be one of the best early stereo jazz recordings. It is really neat to hear Hawkins and Coltrane playing on the same album. 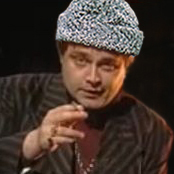 I do love your blog, great sounds, witty and informative. Cheers! Too kind Martin, too kind. I was just thinking, we need a new Assistant Vice-President for Marketing and External Affairs, and you seem just the right man for the job. But with City Hall budget cuts imminent, it might be a while. Don’t give up the day job just yet.